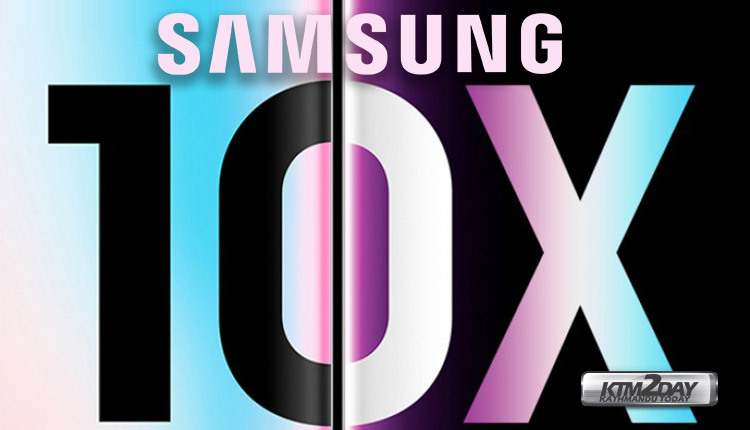 Korean online website ETNews has announced that the first phone with support for Samsung’s 5G will be called Galaxy S10 X.
X means 10 (the Galaxy line completes 10 years this year) but also “eXperience” and “eXpansion”. The phone will be launched in late March in South Korea after the launch in early March of the other Galaxy S10 models. The price of the model should be around $1500. According to the Korean publication, the 5G-enabled Galaxy S10 X will include the same in-screen ultrasonic fingerprint scanner scheduled for the regular 4G-touting Galaxy S10 and Galaxy S10 Plus, as well as a whopping 1TB of built-in storage, a huge 5,000mAh battery, and 10GB of RAM or more. It looks like there will not be a separate Unpacked event on the MWC, which suggests that the 5G phone will be unveiled on February 20 along with S10 models as well as the foldable model . According to several rumors that have emerged so far, the Galaxy S10 may have four variants, Galaxy S10 Lite, Galaxy S10, S10 Plus and a variant with 5G , and should be the latest version that will feature the 12GB of RAM and 1TB of storage, and could be the first smartphones in the market with these specs. Similarly, Samsung will also debut the Infinity Display, the first of Samsung with full screen in the front panel, with a large area of ​​occupancy, and the front camera may be the only thing in the front with a hole in the screen. Some images of concepts even seem strange and leaves us with some doubts, but given that the notch has and is still very widely used, we are no longer left by surprises. One of the new variants will be a Lite version, which could have a 5.8-inch screen without curvature on the sides, while the Galaxy S10 and S10 Plus will have curved screens and the cameras will be double and triple, respectively. The 5G version could have a screen of 6.7 inches with display hole camera. As it has been published several times, there will be three variants of the S10, a Lite version, a normal S10 variant and a Plus variant. The cheapest of all the variant – Lite will be priced at approximately $770, while there will be two versions of the normal S10 with a curved screen on the sides and 6.1 inches. The price of this handset will be $910, for the 128Gb version and $1140 for the 512GB version. Then there will be the Galaxy S10 Plus, which will cost $1020 with 128Gb and $1250 for the 512GB version. It will be the Galaxy S10 Plus that will have an option with 1TB of storage and that will have a record price of $1590. It is not confirmed whether this handset will be the one with 5G technology.